See The Blizzards for FREE at Warehouse this Friday! 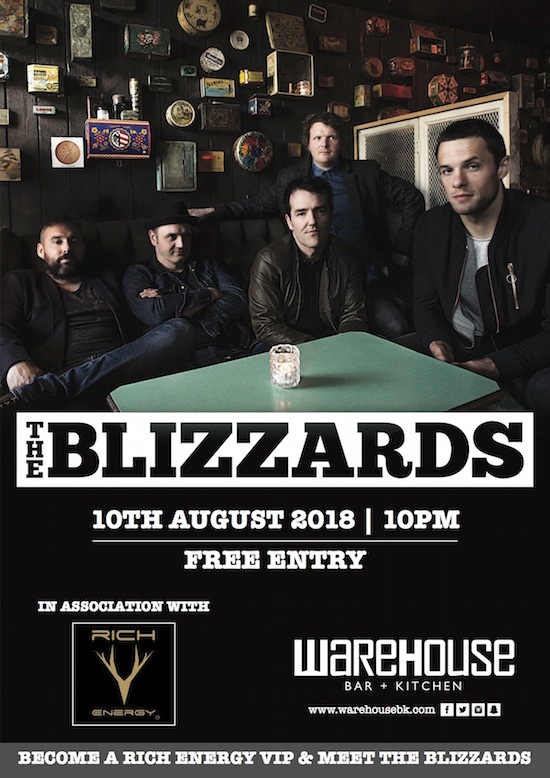 The Blizzards are back and you can see them free this Friday, August 10th LIVE at Warehouse. After a 6 year hiatus, the band are back with a bang. The Mullingar five are kicking things off with the release of their new single “Love Ne Later” on their very own record label “Reckless Records”. The Blizzards have shared stages with such musical heavyweights as Oasis, Kaiser Chiefs, The Prodigy and AC/DC so we are over the moon to have them performing in Warehouse this summer. The boys have big things planned in the next couple of months, with an album in the works, the boys are hitting the ground running and we couldn’t be happier to be part of this. So now is your chance to catch an explosive set from the band – for FREE! See you all there this Friday.